SYNOPSIS: Robert Carradine and Cherie Currie play a young couple living in the Hollywood hills. Currie has a psychic connection to voices that are calling to her. This leads the couple into the desert with their cantankerous neighbor, Keenan Wynn, who helps them find an old mineshaft leading to a secret government lab. 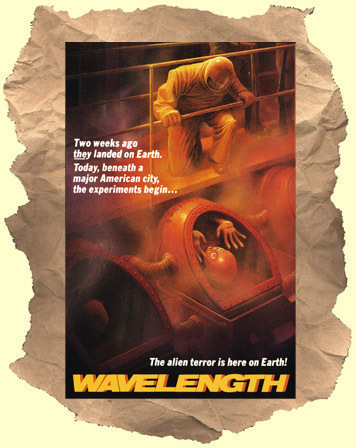 Inside the lab they find that the voices belong to small child-like aliens who tapped into Currie's "wavelength". The aliens were locked away for study by the CIA, NASA, etc. after their ship crashed on Earth. It's up to the couple to break them out and get to an alien rescue ship. This one is a thoughtful, overlooked, cult favorite. If you grew up watching cable TV back in the 80's you probably saw this one between viewings of Hanger 13 and E.T.. Music by Tangerine Dream.